Come together: Displays to mark 50 years of Beatles in India . Beatles Radio: The Beatles, Solos, Covers, Birthdays, News The Fab 4 and More! 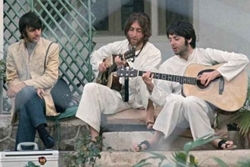 In rumpled white kurtas and pyjamas, John Lennon and Paul McCartney strum their guitars on the steps of a verandah. Ringo Starr, a bit out of place in a long coat, looks on. With marigold garlands around their necks, Starr and McCartney -- this time with George Harrison -- sit cross- legged on a dais, in front of yoga guru Mahesh Yogi, and with a host of others. The stills, among the many photographs that capture the seven weeks the Fab Four spent in the yogi's ashram near the Ganges, will be on display in Liverpool, UK, from next month to mark 50 years of The Beatles in India, an event that will also be celebrated by the ashram, organisers said. One of the sitars of composer-instrumentalist Ravi Shankar, who famously introduced The Beatles to Hindustani classical music, will also be on display at Liverpool.